There is an emerging trend in healthcare that is shifting focus from the mere treatment of disease to the promotion of wellness. In recent months, doctors at Massachusetts General Hospital have teamed up with the Appalachian Mountain Club to launch Outdoors Rx. This initiative is designed to combat disease which stems from inactive lifestyles — like childhood obesity, Type 1 diabetes, and asthma. Doctors are prescribing outdoor activities to patients. These prescriptions are then filled by the Appalachian Mountain Club. Brilliant. 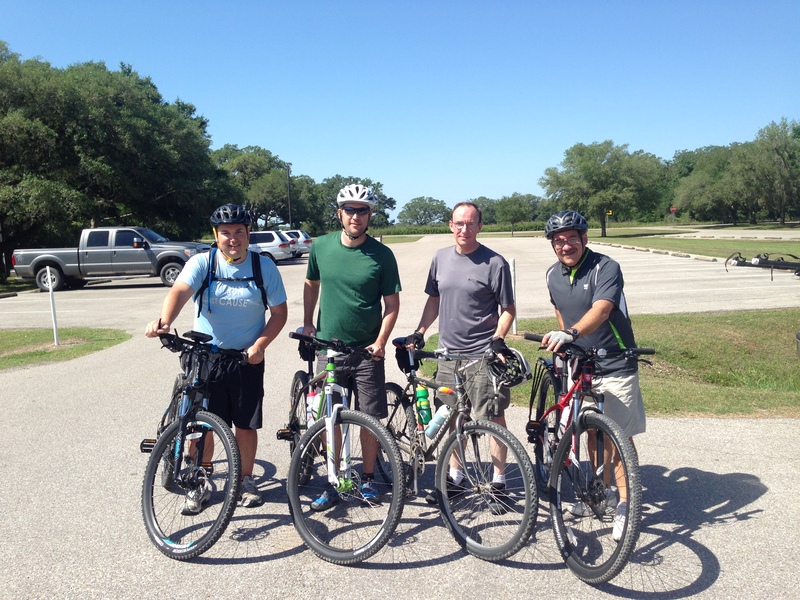 Biking at Brazos Bend State Park with some good Kingsland friends. Outdoors Rx is giving new meaning to “giving someone their walking papers.” The truth of the matter is that too many Americans live sedentary lifestyles and should get out and walk or bike or swim or whatever the doctor orders. Watching Bear Grylls slide down a rocky hill from your easy chair or playing video games does not burn many calories. Many health issues are related to poor diet, lack of activity, and a lack of exposure to fresh air. Dr. Christian Scirica, a physician at Massachusetts General Hospital, said, “In addition to the widely known benefits of physical activity, research studies have found that exposure to natural environments also improves physical and emotional health. Exposure to the outdoors has been found to reduce the risk of high blood pressure, Vitamin D deficiency, depression and anxiety, and may even improve attention.” According to Dr. Scirica, spending time outdoors has the added benefit of improving mental health. I recently read “The River of Doubt” by Candice Millard, the account of Theodore Roosevelt’s epic journey to map an uncharted tributary of the Amazon River in Brazil. Roosevelt was a sickly child. When he was 11 years-old his father told him, “Theodore, you have the mind but not the body, and without the body the mind cannot go as far as it should. You must make your body. It is hard drudgery to make one’s body, but I know you will do it.” And do it he did! Teddy Roosevelt got outdoors and exercised and changed the course of his life. Millard writes, “Throughout his adult life, Roosevelt would relish physical exertion, and he would use it not just to keep his body fit and his mind sharp but as his most effective weapon against depression and despair.” That’s why, in his fifties, Roosevelt was able to face his toughest physical challenge on the River of Doubt deep in the Amazon jungle, a journey that demoralized and even took the lives of younger men on the expedition. I applaud the doctors at Massachusetts General Hospital and other doctors around the nation who are proactively doing something to fight the problems caused by nature deficit disorder — spending too much time indoors. But, don’t wait for a doctor to give you a prescription. Take the initiative to get outdoors, get your heart rate up, and breathe fresh air. Do something hard and feel the burn. Doctors are reporting an improvement in the health of patients who are venturing out to neighborhood walking and biking trails, to state and national parks, and other outdoor settings. I hope you have a healthy week. Be sure to spend some time outdoors. It will do your body, heart, and mind a lot of good. Thanks, Mike. I appreciate your kind words.